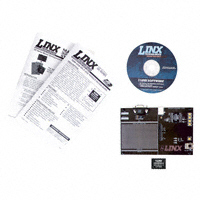 This Master Development System is designed to assist in the rapid evaluation and integration of the QS Series USB module. It contains a fully-assembled development board and comprehensive software that demonstrates the interface of a microcontroller or RS-232 device with a PC via the module. Much of the source code is included to help speed development of custom software. A prototyping area with a signal breakout header and complete documentation speeds the addition of USB to virtually any device.